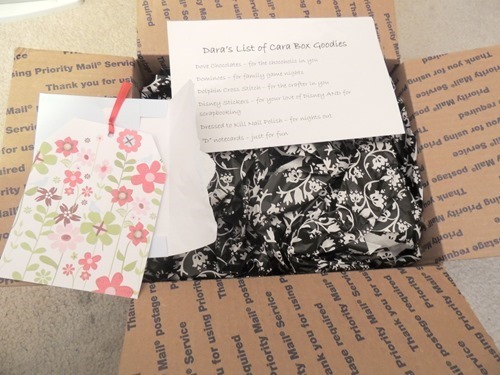 This was my second month participating in the Cara Box exchange run by Kaitlyn at Wifessionals. 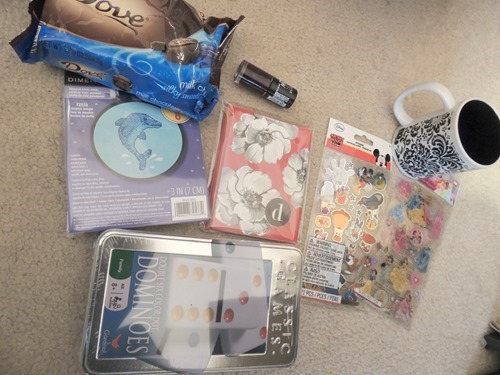 This is such a fun swap because each month has a theme that you use to fill your swap box for your partner. This month’s theme was “My Name Is…” and the idea was to send items beginning with the first letter of our partner’s name. I sent to Andrea and the letter A wasn’t too hard to work with! I was curious to see what my partner would send me with the letter D, but I didn’t think too hard about it because I didn’t want to spoil the surprise! The person who sent to me was Holly. Somehow or another we managed to get to chatting via email since we met via this swap and I now consider her a great friend! I wrote her probably the longest email ever and she really understands what I was writing about. We have so much in common and I feel honored to know her. I was very excited to receive my box! When I opened it, I found this lovely paper hiding what was inside, but I of course read the description and card enclosed! Damask Mug – which I then realized matches the paper! One of my first thoughts was that I would be sharing some of these goodies with my daughter – hey that starts with D too! What actually happened is that I ate a lot of chocolate. (I did share!) And my son confiscated the dominoes! All 3 kids have been playing with them ever since. I’m not sharing the Disney stickers though! Thanks so much for everything Holly! PS Don’t forget to enter my giveaway!! Previous Post 300 Followers Giveaway!